There is more than one home remedy for constipation, which was also called “costiveness” in the old days. Constipation is the inability to have bowel movements on a regular basis. It can cause bloating, sluggishness, fatigue, irritability and discomfort. "Constipation means the production of many poisons in the digestive tract which are absorbed into the system and produce a chronic state of disease." "If medicine is needed, take 10 to 20 drops of Fluid Extract Cascara Sagrada once or twice a day. Massage over bowels will cure many cases." Dr. Chase referred to cascara sagrada, an herbal remedy, as "medicine!" The healing power of herbs was held in great regard by many old-time physicians and they relied on natural herbal remedies as much as modern physicians rely on synthetic drugs and chemicals. Take one teaspoonful three times a day until the bowels move, then take one teaspoonful at bedtime until cured. Take one teaspoon three times a day until bowels become easy, then two times a day until there is daily healthy action. This recipe is valuable for women because berberis, or Oregon grape, is considered a tonic for the uterus and is called the "female regulator." Natural Moves is 100% gentle, natural and effective herbal formula that treats constipation without the risk of dehydration, mineral imbalance and dependency. 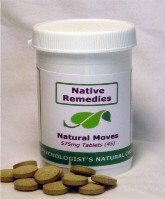 Natural Moves Tablets can be used for both chronic and occasional constipation, depending on the dosage used. The herbal ingredients promote healthy digestion and also act as an effective liver tonic, therefore avoiding the risk of dependency and side effects associated with some other laxative products. Natural Moves combines Aloe Vera and Taraxacum officinale (Dandelion), both known for their laxative properties and beneficial effect on digestive health. Passiflora is added to relax the muscles of the bowel wall and to relieve stress and anxiety which is often associated with digestive complaints like constipation and IBS.